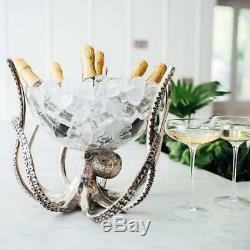 Octopus Stand Glass Bowl Ice Wine Beer Bottle With Bucket Cooler Stainless Steel. 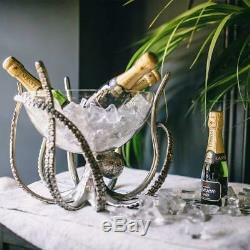 Our Octopus Stand and Bowl is a real show-stopper and will make the perfect nautical centrepiece for your parties and celebrations. 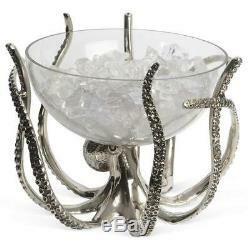 With its contemporary glass bowl spectacularly held aloft by the Octopus' tentacles, fill with ice and use to cool a refreshing beer or bottle of wine or fill with a delicious salad or pasta dish to feed hungry guests. 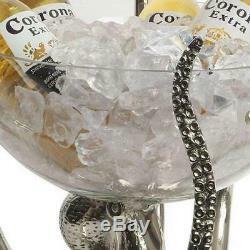 26.5H x 32W x 32D cm. 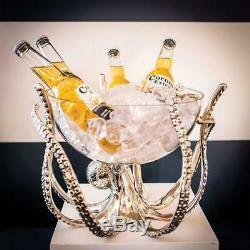 12.7 x 32 x 32 cm. We go above and beyond to ensure you receive the best level of service. 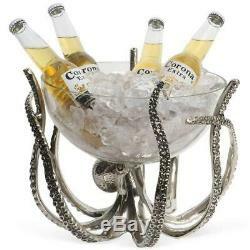 The item "Octopus Stand Glass Bowl Ice Wine Beer Bottle With Bucket Cooler Stainless Steel" is in sale since Friday, January 4, 2019. 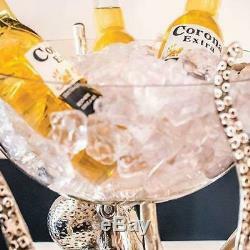 This item is in the category "Home, Furniture & DIY\Cookware, Dining & Bar\Bar & Wine Accessories\Ice Buckets & Wine Coolers". 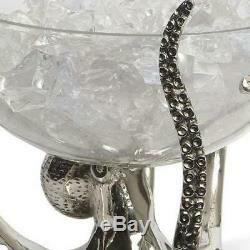 The seller is "rosiesboudoir" and is located in Northampton. This item can be shipped to United Kingdom, Austria, Belgium, Bulgaria, Croatia, Cyprus, Czech republic, Denmark, Estonia, Finland, France, Germany, Greece, Hungary, Ireland, Italy, Latvia, Lithuania, Luxembourg, Malta, Netherlands, Poland, Portugal, Romania, Slovakia, Slovenia, Spain, Sweden, Australia, Canada, Brazil, Japan, New Zealand, China, Israel, Hong Kong, Norway, Indonesia, Malaysia, Mexico, Singapore, South Korea, Switzerland, Taiwan, Thailand, Chile, Antigua and barbuda, Bangladesh, Belize, Bermuda, Bolivia, Barbados, Brunei darussalam, Cayman islands, Dominica, Ecuador, Egypt, Guernsey, Gibraltar, Guadeloupe, Grenada, French guiana, Iceland, Jersey, Jordan, Cambodia, Saint kitts and nevis, Saint lucia, Liechtenstein, Sri lanka, Macao, Monaco, Maldives, Montserrat, Martinique, Nicaragua, Oman, Pakistan, Peru, Paraguay, Reunion, Turks and caicos islands, Aruba, Saudi arabia, South africa, United arab emirates, Ukraine, United States.